But the problem is when I am typing http://www.example.com/fruits/apple1 which is not a valid url then the content of Term id 1 is getting loaded since it is matching till "fruits". In such scenario I want the site to be getting redirected to a 404 page instead of matching termid of "fruits". I need the full taxonomy url to be valid or redirect to 404. I am using views taxonomy term page (Default one which by default remains inactive) where a wild card character is there taxonomy/terms/%. Please help. I cant find a suitable solution for the same. If you are using contextual filter, then there is validation criteria in settings of taxonomy term name you have selected. 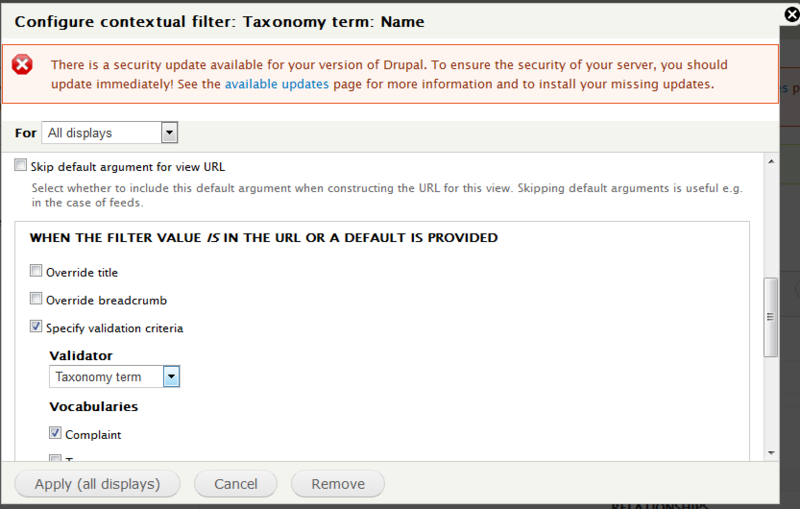 Then add filter value type as taxonomy term name and add action as page not found. Force redirect if a valid taxonomy term is not at the start of the URL?